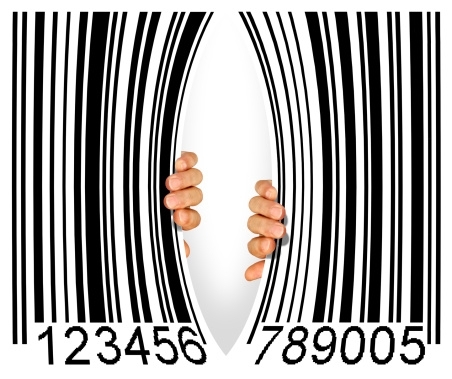 The basic process in reading barcodes is to locate and illuminate the code and then extract the data. ‘Old fashioned' 1D barcodes, have a ‘check sum' built in so that a laser scanner can tell if there is an error reading, but can do nothing about it except to say ‘unreadable'. New, vision based readers have a much better chance of reading a 1D code because if any part of the bar is intact, it can use that information. These dedicated code readers feature an integral illumination source and lens and an image of the code is produced using a CCD sensor. The ‘onboard' software will read the code and process the image. These vision based readers can also read low contrast or damaged codes as well as codes distorted by perspective. Barcodes are very easy to add to asset labels or asset tags. Even if you do not have a barcode system, we recommend that you put barcodes on your asset labels. It can be very expensive to add barcodes to your asset and equipment labels at a later stage and there is no cost to add this feature to your asset labels at the outset. 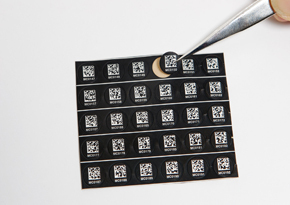 Barcodes simplify asset label identification and provide a simple, accurate and cost effective way for identifying a unique number and asset. Barcodes will also help identification. The black and white bars represent a unique identification for an asset and the barcode provides a simple, accurate and cost effective way for identifying a unique number by using a barcode scanner and makes barcodes ideal for a quick inventory of your assets. Thus, the cost of adding a barcode to you asset labels is minimal, but the benefits are potentially large. 2D codes allow much more information to be stored than is possible with a 1D code - and in a much smaller space. The 2D Datamatrix code format includes built-in ECC220 error correction to allow the recognition of codes even if they are 60% damaged. Codes are usually printed onto labels ready to be applied to the asset, parts, cartons, etc. Dantech is a leading provider of asset labels and asset marking solutions. Our knowledge is extensive and our customers include companies, schools and universities, health sector organisations, the police, local and central governments, as well as manufacturing plants and warehouses. For expert advice call us on 01354 688 488 or complete our contact form.